Being a vegetarian will not prevent you from having a tasty Khow Suey. You can still have Khow Suey with vegetables. 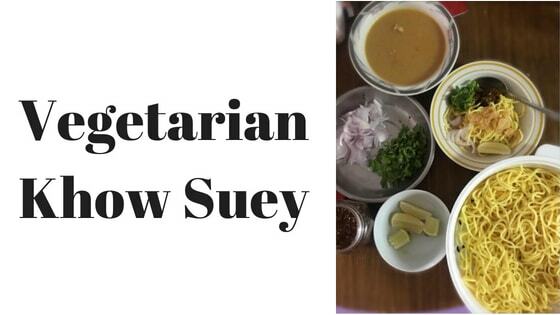 Here is our quick guide on how to make authentic vegetarian Khow Suey in very easy way. If you want some additional ingredients, here are some options. Depend on your taste, you can add top ups of your choice as a Khow Suey accompaniments. If you eat meat, you can also add boiled eggs as a accompaniments. 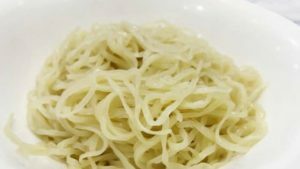 Even if you are using wet noodles, you should boil noodles in salted water and soak with oil to prevent it from sticking. It will also help you to handle noodle easily. How to prepare coconut soup? Put a deep pot pan on a low heat and then add some oil. Let them heat up. Then add curry leaves, cumin, turmeric and chilli powder. Then cook for two minutes. Add the tofu and mushrooms (this is optional and only if you choose to add tofu and mushrooms to the soup. If you use tofu and mushrooms, it will somehow taste like Thai Tom yam soup). Then cook for another one minute. This step is very important that you need to add coconut milk. You need to make sure to use low heat throughout this step. If not, the coconut milk may curdle. Next step is to add lemon grass. Let them simmer for around 10 minutes until all flavors are mixed. Then you can take out the lemon grass and you can discard it. According to your taste, you can add salt and pepper. You can also add lemon juice and then stir throughly. How to prepare Khow Suey accompaniments? While coconut soup is simmering, you can prepare the accompaniments. Deep fry the onions and put into a plate. Deep fry garlic until it becomes crispy. Chop up the onions and peppers. You should use different bowls for each ingredients. How to serve Khow Suey? Serving Khow Suey is easy. Each person should be served with a large bowl. You should just prepare separate container for noodles, coconut soup and accompaniments. They best way to eat Khow Suey is to mix noodle with coconut soup and add accompaniments of your choice. Then you can enjoy very delicious vegetarian Khow Suey.